Focus of the Week: Following the release of the H1’2017 results by listed insurance companies, we analyzed the results of the listed insurance companies, the current state and outlook of the industry to determine which companies are the most attractive and stable for investment from a franchise value and from a future growth opportunity (intrinsic value) perspective. During the week, T-bills were undersubscribed, with the overall subscription rate coming in at 42.7%, compared to 63.2% recorded the previous week, due to relatively tight liquidity in the money market. The subscription rates for the 91, 182 and 364-day papers came in at 63.4%, 43.6%, and 33.7% compared to 121.8%, 22.2% and 80.7%, respectively, the previous week. Yields on the 91, 182 and 364-day papers remained unchanged from the previous week at 8.1%, 10.3% and 11.0%, respectively. The overall acceptance rate came in at 95.5%, compared to 87.0% the previous week, with the government accepting a total of Kshs 9.8 bn of the Kshs 10.3 bn worth of bids received, against the Kshs 24.0 bn on offer in this auction. The government is behind its domestic borrowing target for the current fiscal year, having borrowed Kshs 51.0 bn, against a target of Kshs 118.3 bn (assuming a pro-rated borrowing target throughout the financial year of Kshs 410.2 bn budgeted for the full financial year as per the Cabinet-approved 2017 Budget Review and Outlook Paper (BROP)). Liquidity in the money market remained relatively tight during the week, with a net liquidity injection of Kshs 0.3 bn, compared to a net injection of Kshs 2.2 bn the previous week. The bulk of the liquidity injection came from Reverse Repo Purchases of Kshs 30.6 bn as the CBK looked to counter the high liquidity reductions brought about by Reverse Repo Maturities and Transfer from Banks – Taxes, of Kshs 35.8 bn and Kshs 24.4 bn, respectively. The tight liquidity in the market saw the average interbank rate remain high at 8.0% from 8.1% recorded the previous week. The average volumes traded in the interbank market increased by 54.6% to Kshs 30.7 bn from Kshs 19.9 bn the previous week. For the month of October, the government is issuing a new 5-year bond (FXD 2/2017/5), in a bid to raise Kshs 30.0 bn for budgetary support. The value date for this issue is on 23rd October, with the period of sale ending a week earlier, on 17th October. Given that the government is behind its domestic borrowing target, we expect investors to bid slightly above the secondary market yield, which is at 12.4% for a similar tenor bond, and we would therefore bid at a range of between 12.4% - 12.6% for this particular issue (FXD 2/2017/5). According to Bloomberg, yields on the 5-year and 10-year Eurobonds remained relatively unchanged during the week at 4.0% and 6.3%, respectively. Yields on these two bonds have been on a downward trend since July, and this can be attributed to the stability that has prevailed during the Kenyan General Election period. Since the mid-January 2016 peak, yields on the Kenya Eurobonds have declined by 4.8% points and 3.4% points for the 5-year and 10-year Eurobonds, respectively, due to stable macroeconomic conditions in the country. Despite this, the uncertainty surrounding the Presidential Election has seen yields on the two bonds rise slightly by 0.1% points and 0.2% points over the last month for the 5-year and 10-year bond, respectively. The declining Eurobond yields and stable rating by Standard & Poor (S&P), in spite of the political uncertainty around the presidential poll re-run are indications that Kenya’s macro-economic environment remains stable and hence an attractive investment destination. However, concerns from Moody’s around Kenya’s rising debt to GDP levels may see Kenya receive a downgraded sovereign credit rating. The Kenya Shilling depreciated slightly against the US Dollar (USD) during the week to close at Kshs 103.3, from Kshs 103.2 recorded the previous week, due to increased demand from oil importers, with any further depreciation being cushioned by diaspora remittances and horticulture revenue. On a year to date basis, the shilling has depreciated against the dollar by 0.8%. In our view, the shilling should remain relatively stable against the dollar in the short term, supported by (i) the weakening of the USD in the global markets, (ii) increased diaspora remittances that grew by 5.3% to USD 1.0 bn in 7 months to July 2017 from USD 987.2 mn over a similar period last year, and (iii) the CBK’s activity, as they have sufficient forex reserves, currently at USD 7.4 bn (equivalent to 4.9 months of import cover). The key factor to watch is the current account deficit that worsened to 6.2% of GDP in Q2’2017, as compared to 5.3% of GDP in a similar period last year. This week, the High Court directed the Independent Electoral and Boundaries Commission (IEBC) to amend a gazette notice it had issued on the presidential candidates to contest in the fresh election, to include Thirdway Alliance Candidate, Ekuru Aukot. Consequently, IEBC has announced that it shall include all the 8 presidential candidates who participated in the 8th August poll in the fresh election. This follows announcement by the opposition coalition (National Super Alliance, NASA) of its intention to withdraw from the repeat presidential poll set for 26th October, citing reforms that are yet to be implemented following the annulled 8th August poll. Following these recent turn of events, we expect businesses to go about their activities with increased caution and thus subdued activity is expected over the coming few weeks, as investors take a wait and see approach. We maintain the view that the market should normalise once the country takes to the polls, the election is concluded, and fears and uncertainty dissipates, with the Kenya growth fundamentals remaining strong and intact. The World Bank reported that it expects growth in Sub-Saharan Africa to strengthen to 3.2% in 2018, while Kenya is expected to grow at 5.8% in 2018, lower than 6.1% estimated at the start of the year, primarily due to the drought experienced in the first half of the year and the capping of interest rates that is expected to subdue growth. The upgrade on the Sub-Saharan Africa growth prospects is supported by moderately rising commodity prices and reforms to tackle macro-economic imbalances in the region. In our view, we maintain our expectation that 2017 GDP growth for Kenya will slow down and come in between 4.7% and 5.2% due to a slowdown in agriculture and finance & insurance owing to (i) slower growth of the agriculture sector, (ii) the interest rate caps, which will reduce corporate earnings for commercial banks, (iii) increased political uncertainty around the presidential poll re-run forcing investors to take a wait and see stance, and (iv) slow private sector credit growth. During the week, the equities market was on a downward trend with NSE 25, NSE 20 and NASI losing 2.2%, 1.8% and 0.9%, respectively, taking their YTD performance to 19.4%, 16.8% and 13.8% for NASI, NSE 25 and NSE 20, respectively. This week’s performance is attributable to losses by select large cap stocks such as KCB Group, Barclays and Equity Group, which lost 7.5%, 6.4% and 2.7%, respectively. Since the February 2015 peak, the market has lost 10.3% and 34.1% for NASI and NSE 20, respectively. Equities turnover increased by 61.7% to USD 25.4 mn from USD 15.7 mn the previous week. Foreign investors turned net sellers with a net outflow of USD 0.3 mn compared to a net inflow of USD 0.2 mn recorded the previous week. We expect the market to record subdued activity over the coming few weeks as market players remain cautious of the renewed political uncertainty in the country. Despite this, we expect the market to remain strong supported by the attractive valuations in select counters and the expected improvement of investor confidence once the country takes to the polls for the presidential elections scheduled for October 26th. The market is currently trading at a price to earnings ratio (P/E) of 12.8x, versus a historical average of 13.4x, and a dividend yield of 4.1%, compared to a historical average of 3.7%. Despite the valuations nearing the historical average, we believe there still exist pockets of value in the market, with the current P/E valuation being 24.6% below the most recent peak in February 2015. The current P/E valuation of 12.8x is 31.5% above the most recent trough valuation of 9.7x experienced in the first week of February 2017, and 53.5% above the previous trough valuation of 8.3x experienced in December 2011. The charts below indicate the historical P/E and dividend yields of the market. The CBK and Kenya Deposit Insurance Corporation (KDIC) announced that they received a non-binding offer from SBM Holdings with respect to Chase Bank Limited (In Receivership) (CBLR). The non-binding offer, which received support from CBLR depositors and shareholders, is still subject to confirmatory due diligence and a binding contract, and is expected to among other things, ensure a substantial recovery for depositors currently under moratorium and a transfer of a substantial number of staff and branches of the existing CBLR operations. SBM Holdings, which is the second-largest bank in Mauritius with a market share of about 25%, recently entered the Kenyan market through acquisition of Fidelity Bank in May 2017 and currently has 10 branches. The proposed transaction, which is expected to be concluded by end of 2017, will enhance competitiveness in the sector as SBM acquires a larger market share, and will result in further strengthening of the Kenyan banking sector. According to the Central Bank of Kenya (CBK), cash transacted through mobile money channels dropped by 7.3% to Kshs 286.3 bn in August from Kshs 308.9 bn in July mainly attributed to reduced business activity as a result of (i) political uncertainty in the country due to prolonged electioneering period, and (ii) the decline in lending to the private sector as indicated by slow private sector credit growth of 1.6% as at August 2017. Mobile money payments are increasingly being adopted by individuals and firms, with the latest data by Communications Authority of Kenya (CA) showing that mobile money subscriptions currently stand at 28.1 mn while the value of transactions hit Kshs 1.2 tn for the quarter ended June 2017. Mobile money platforms include Safaricom’s M-Pesa, Airtel Money, Telkom Money, Equity Group’s Equitel, Tangaza and MobiKash. With the rapid population growth of 2.6%, the mobile penetration rate at 88.7% and technological advancements, we expect increased growth in mobile payments segment as more firms adopt the convenient medium of money transfer. Standard Group appointed Dr. Julius Kipngetich as an Independent Non-Executive director. Standard’s score has improved to 72.9% from 70.8% due to increase in board size to an odd number 9 from an even number 8. Its ranking has improved to position 19 from position 20. Given increased public interest in the Corporate Governance Report (CGR), we held a corporate governance workshop to get feedback and views from the corporate governance stakeholders on the methodology and framework of the report. The event was well attended by representatives from listed firms, Saccos, Pension Trustees and Professional bodies. Changes made to the current metrics as guided by the feedback can be accessed here. New York based technology firm, Andela, has raised USD 39.7 mn (Kshs 4.1 bn) from DBL Partners, Amplo, Salesforce Ventures, Africa-focused TLcom Capital and existing investors (Google Ventures and Spark Capital) to fund technology firms in Kenya, Nigeria and Uganda. This brings the Andela Africa-based start-up’s funding to over USD 78.4 mn (Kshs 8.1 bn). The Kenya office in Nairobi has supported 300 local engineers in the Kenya technological space. Andela currently has other offices in Nigeria and Uganda, with plans to open two more offices in the African region in the next year to double its developer base from 500 to 1,000. The continued interest by investors in technology-driven companies in Sub-Sahara Africa is catalysed by the rising need for technology products as more businesses seek to enhance efficiency and reduce costs. The rising number of tech hubs in Africa, which support the growth of tech startups by providing mentorship has also provided a platform through which investors can easily identify opportunities to invest in. According to the World Bank, tech hubs in Africa have increased from 117 in 2015 to 173 in 2016, with South Africa and Kenya leading with 32 and 16 tech hubs, respectively. Just this year, several tech backed businesses have received funding from both local and international investors, including: (i) Bamba Group, a company providing SMS based solutions and data collection software for companies, raised USD 1.1 mn, (ii) BitPesa, a Kenyan digital currency payment platform closed a USD 2.5 mn funding round, (iii) Mobile credit firm, Tala, raised more than USD 30.0 mn, (iv) Kenya’s Twiga Foods Ltd, a mobile based food supply platform raised USD 12.78 mn (Kshs 1.3 bn), and (v) Shortlist, a Kenyan-based employment tech start-up, received Kshs 103.0 mn seed funding in both equity, for an undisclosed stake, and debt from US-based private equity firm University Ventures, Indian angel investor Samir Shah of Sattva Capital, Kenya-based seed fund Zephyr Acorn, global impact investor FARM Ventures, and US-based investor Bodley Group. We remain positive about investment in technology and tech-backed businesses, as the Sub-Saharan African region continues to witness increased integration of technology in businesses as well as increased automation of business processes by SMEs. Private equity investments in the Sub-Sahara African Region remains robust as evidenced by the increased deal flow in a number of sectors that support growth. The increasing investor interest in private equity investment in sub-Sahara Africa is attributed to (i) rapid urbanization, a resilient and adapting middle class and increased consumerism, (ii) the attractive valuations in the private markets compared to the public markets, (iii) the attractive valuations in Sub Saharan Africa’s markets compared to global markets, and (iv) better economic projections in Sub Sahara Africa compared to global markets. We remain bullish on PE as an asset class in Sub-Sahara Africa. Going forward, the increasing investor interest and stable macro-economic environment will continue to boost deal flow into the market. During the week, the State Department of Housing and Urban Development unveiled a Building Research Centre as a strategy to address the current housing shortage. Currently, developers provide less than 50,000 units annually, mostly targeted for high and middle-income earners, against a national housing deficit of 2.0 mn units especially for the low-income earners market, which according to the World Bank, Kenya Economic Update 2017, 61% of the urban population live in slums. The research centre will bring together both private practitioners and housing sector stakeholders in joint efforts to address the shortage. In our view, the centre is an important step towards addressing the housing shortage and will enhance consultations among the stakeholders, enabling innovation and solution-oriented policies against factors that have been hindering the success of provision of low cost housing in the region such as (i) the prohibitive land costs, as per the Cytonn Nairobi Metropolitan Area Land Report, land prices increased 2.5x between 2011 and 2016, and (ii) further improvement of land legal processes such as opacity on issuance of title deeds. These will thus enable faster solutions to the housing problem. Also during the week, the retail sector recorded heightened activity with Next Gen Mall, located along Mombasa Road, announcing that a new anchor tenant - Souk Bazaar- will take up the space vacated by Nakumatt, which occupied 60,000 SQFT. The new anchor tenant is set to open its doors to shoppers next week occupying 90,000 SQFT, on a 20-year lease. The retail outlet is owned by the same developer of the Nextgen Mall. This is in tandem with our view that, the retail sector is set for a paradigm shift following the recent crisis faced by anchor tenants such as Nakumatt. We expect malls to replace externally-owned supermarkets with other retail outlets such as fast food stores which also have high footfall. Rapid infrastructural improvement such as improved roads, upgrade of key airports and utility connections that facilitates accessibility to viable areas of investment. Kenya Airways won the award for Africa's leading airline and the continent's leading airline -Business Class. This acts as an endorsement and is set to boost the hospitality sector further, through expected increase in tourist arrivals. According to Kenya National Bureau of Statistics’ Leading Economic indicators, August 2017 release, the total number of visitors arriving through Jomo Kenyatta International Airport (JKIA) and Moi International Airport (MIA) increased by 12.6% to 543,154 between January and July 2017 from 482,470 during the same period in 2016. In other highlights, a new low cost airline was unveiled in Kisumu, which is set to boost domestic tourism. The new airline, Silverstone Air, will have two daily flights to Kisumu and Ukunda from Wilson Airport with plans to include other areas like Malindi, Lamu, Marsabit, Garissa, Homabay and Moyale. The introductory one-way tickets from the airline will cost Kshs 4,500. The dominant domestic airlines include Kenya Airways, Jambojet, Fly540, and the recently launched Britex Air Services, which charge Kshs 7,635, Kshs 4,200, Kshs 6,770 and Kshs 5,200, respectively. According to a report by the World Travel & Tourism Council - Travel and Tourism, Economic Impact 2017, Kenya domestic air travel spending generated 60.8% of direct travel and tourism GDP, compared to 39.2% by foreign tourists spending, and is expected to grow by 6.1% in 2017 to Kshs 284.9 bn from Kshs 267.5 bn in 2016. Consequently, the rise in domestic travel is set to increase demand for hotel beds locally. Additionally, Housing Finance launched Phase 2 of their Komarock Heights estate, which is set to cost Kshs 3.3 bn. The estate will comprise of 480 1, 2 and 3-bedroom units selling at Kshs 3.0 mn, Kshs 4.9 mn and Kshs 5.9 mn, respectively. As per the Cytonn Residential Report 2017, Komarock had returns to investors of 8.0% and 12.7% for detached and apartment units, respectively, against a market average of 9.4% for detached units and 9.5% for apartments. We expect the real estate sector to remain vibrant with the tourism and retail sectors gaining more international focus supported by (i) a growing middle class, (ii) improved infrastructure, and (iii) a growing economy especially once the political tension dies down, with more efforts by private developers and the government geared towards low cost housing for the low income population segment. Following the release of the H1’2017 results by insurance firms, we have carried out an analysis on Kenya’s listed insurance companies to decipher any material changes from our FY’2016 Insurance Report. In our analysis of the insurance sector, we seek to give a view on which insurance firms are the most attractive and stable for investment from a franchise value and a future growth opportunity perspective. The report is themed "Sustaining Profitability in an Era of Heightened Regulation", as the insurance sector still struggles in the local market with low penetration levels, excessive duplication of products and increased capital requirements following full adoption of a risk based capital adequacy framework, as a result of the Insurance (Amendment) Act 2016. The Kenyan economy has experienced stable growth expanding by 5.0% in Q2’2017, higher than Q1’2017 growth of 4.7%, with the Financial Services sector contributing 6.0% to Kenya’s GDP as at Q2’2017, slightly lower than the 6.1% recorded in Q2’2016. The slowdown is attributable to a slowdown in private sector credit growth and reduced profit margins in the banking sector, following the capping of interest rates, and thus the insurance sector will be key to support contribution of the financial services to Kenya’s economic growth. The insurance sector has benefited from (i) convenience and efficiency through adoption of alternative channels for both distribution and premium collection such as Bancassurance and improved agency networks, (ii) advancement in technology and innovation making it possible to make premium payments through mobile phones, and (iii) a growing middle class, which has led to increased disposable income, thereby increasing demand for insurance products and services. These factors have been key in driving growth of the sector despite reduced profitability and are set to continue going forward. On valuations, insurance companies are trading at a price to book of 1.1x compared to the banking sector at 1.3x, which are below historical averages of 1.4x for the insurance sector, and 1.8x for the banking sector. This indicates that both sectors are attractive for long-term investors supported by the strong economic fundamentals and favourable investment environment. Operational Efficiency: Insurance companies in Kenya have been affected adversely by the rising levels of inefficiency in their operations in the recent past, as collection of premiums and distribution of products have emerged to be a costly affair for the insurers. Insurance penetration remains low at 2.8% currently, lower than the average of 3.5% in Africa, indicating that for insurance companies to penetrate the Kenyan market they will need to invest in better and efficient distribution channels. 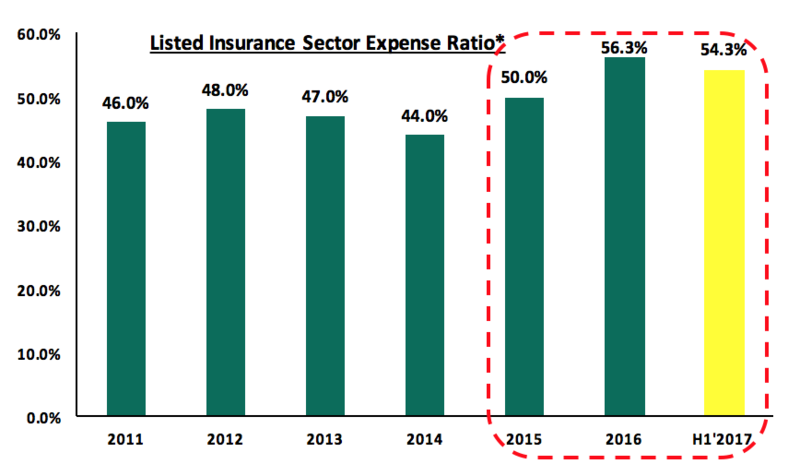 The listed insurance sector expense ratio is more than 50%, indicating more than half of insurance company revenues are used up in administration and distribution expenses, and with loss ratios above 50%, insurance companies are struggling to eke out a profit from their core business. Product Innovation: With the industry combined ratio average at 126.1%, insurance companies are not profitable from their core business, and diversification to alternative revenue streams has been key to their profitability. Insurance products in the market are not tailored to the common consumer and players in the market lack the much needed innovation in product offerings, tailored to meet the needs of their target customers. The informal sector in the country is uninsured leaving a gap for insurance firms to tap into, as most products are currently tailored towards the formal sector and mainly the growing middle class. The value addition area we see is innovation into more relevant products to improve uptake, while also maintaining effective channels of distribution for these products. In the recent past, we have witnessed increased partnerships between insurance firms and banks, with players in the sector aiming to target the banks’ large base of customers to sell their insurance products, the most recent being Standard Chartered Bank’s partnership with Sanlam Kenya. Significant opportunities remain in the Kenyan insurance market, with growth areas identified especially in commercial lines such as oil, real estate and infrastructure. Regulation & Compliance: With the new Insurance Act (Insurance Amendment Act 2016), there has been put in place requirements for increased regulation on capital adequacy and risk charges on respective investment options, that insurance and reinsurance firms will be required to maintain capital in relation to their risk of liabilities held. This will lead to increased risk-based analysis on investments, improved supervision on internal practices and a more regulated insurance sector, thereby improving investor sentiment. In addition, insurance and reinsurance firms will from January 2018 be issued with perpetual licenses saving them the cost of annual license renewal fee, joining the banking sector, which already uses the model since 2015. According to the Financial Services Authority Bill (2017), all financial services firms excluding banks will be regulated by the Financial Services Authority (FSA), and in our view this move is likely to see increased transparency in the financial services industry. Capital Raising Initiatives: The move to a risk based capital adequacy framework is likely to lead to capital raising initiatives by some players in the sector to shore up capital. The solvency margins on the listed insurance space have declined from a high of 30.1% in 2014, to 28.7% in H1’2016, and to 27.8% in H1’2017, indicating that assets have been growing faster than shareholder’s funds. With the new capital adequacy assessment framework, capital is likely to be critical to ensuring stability and solvency of the sector to ensure the businesses are a going concern. In September, Britam Holdings announced a deal to raise Kshs 5.7 bn from Africinvest III, a special purpose vehicle (SPV) managed by Africinvest Capital Partners Management II, and we expect more players to undertake capital raising initiatives to boost their capital; and a rise in mergers and acquisitions in the coming years. Based on the above, we expect increased product innovation and operational efficiency in the sector to drive sustained profitability and thus stability of the sector amidst the heightened regulation. Below are some operating metrics for listed insurance companies in Kenya as at H1’2017. On average, the insurance sector has delivered a Return on Average Equity of 10.9% a marginal improvement from 9.0% in H1’2016. Sanlam retained its bottom position ranking 6th in the franchise score category, and 5th in the total return score category. For more details on the ranking, see our H1’2017 Insurance Report. We also expect that there will be increased regulation in the sector, as well as increased consolidation to reduce duplication of products by insurance companies. These efforts will improve revenue channels for insurance firms and uptake of insurance products to enhance the sustainability of profitability.